Not sure exactly who did this sugar bowl it is not marked. 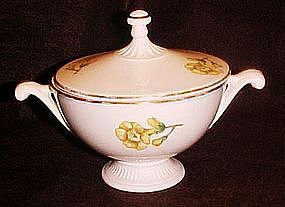 Though it has the sahpe of Hall China, it has the exact buttercup decoration of the Edwin Knowles buttercup pattern. Anyway.... it is sunny and bright and in excellent condition with no chips or cracks. It measures 4 1/4" tall. Gold trim is 95%. Just faded in one area but still nice.